for not going to someplace a long way away. that she did not travel to for some reason. Grandmother, "No, too far and snaky." from Texas to Virginia for me to attend. in Hico, Texas which was only 75 miles away by car. and I found some great treasures to bring home with me. which makes the new OLD 5-gallon crock feel right at home. 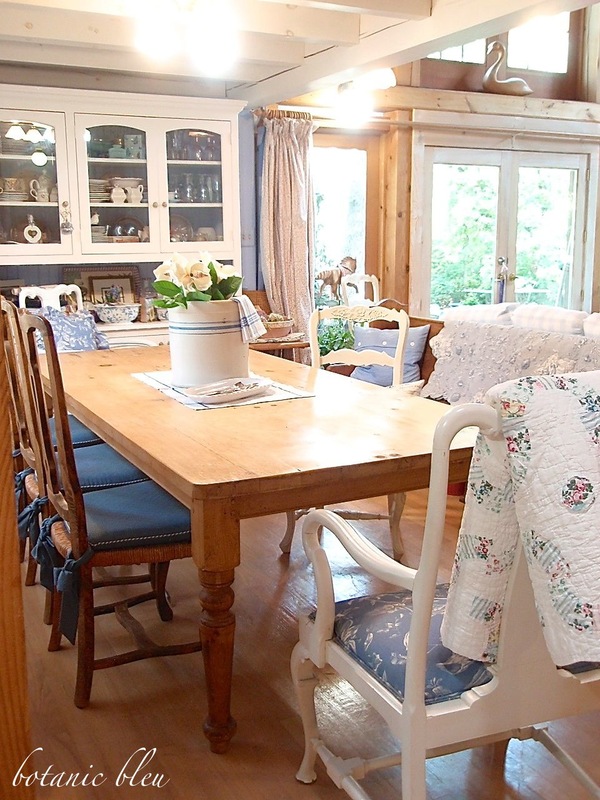 The large size makes it perfect for the vintage pine dining table. 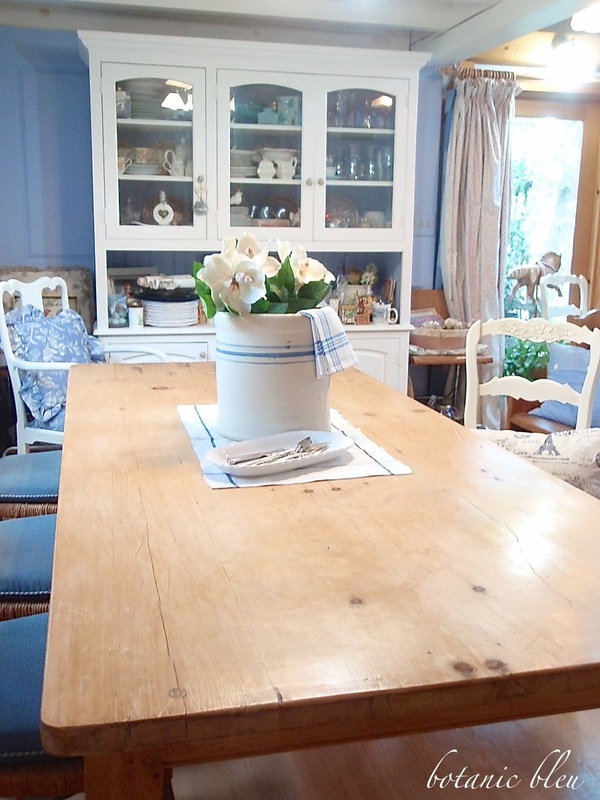 Just this week I cleaned the pine table and gave it a couple of new coats of wax. back to life following water damage. Since then, I give it a new coat of wax every once in a while. can't you just see a ***Christmas tree*** in it! that came right off when I scrubbed it with Bar Keepers Friend cleaner. The crock is a plain design with no sign of the maker, not even on the bottom. how many gallons the crock holds. The blue blends perfectly with all the other light to medium blues in my house. We saw several other stoneware crocks for sale in Hico and surrounding towns. Most had beautiful markings and indicated the manufacturer. The prettiest one I saw had a lily of the valley painted on the front. A price I could not pass by! at Silver Moon Antiques to go with the blue striped crock. 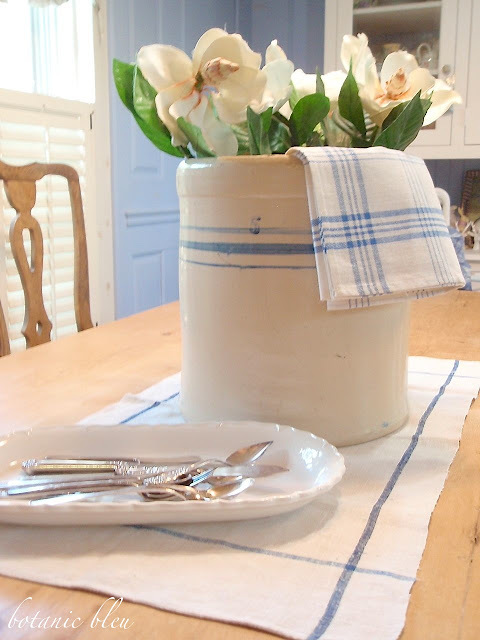 The French linen fabric is heavy with lots of texture. One is long and narrow with a single striped border - great as a table runner. 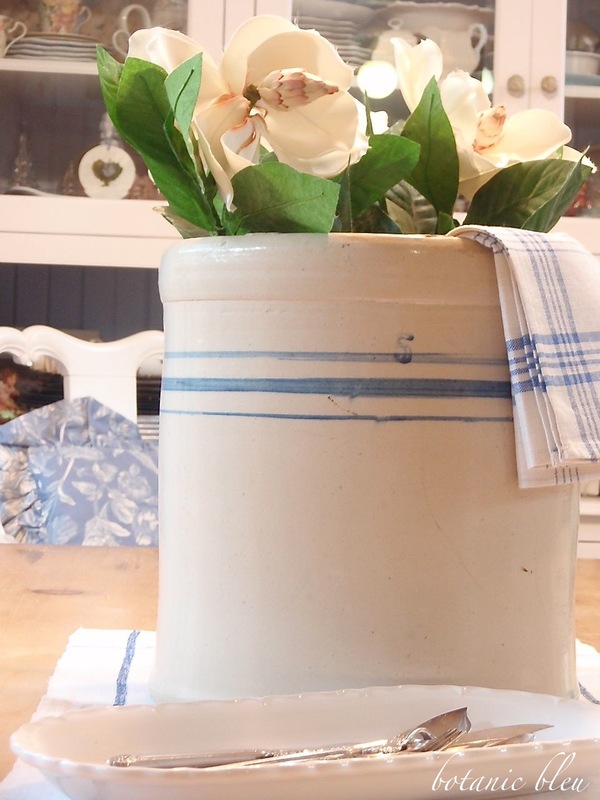 it will be great as a small table topper. 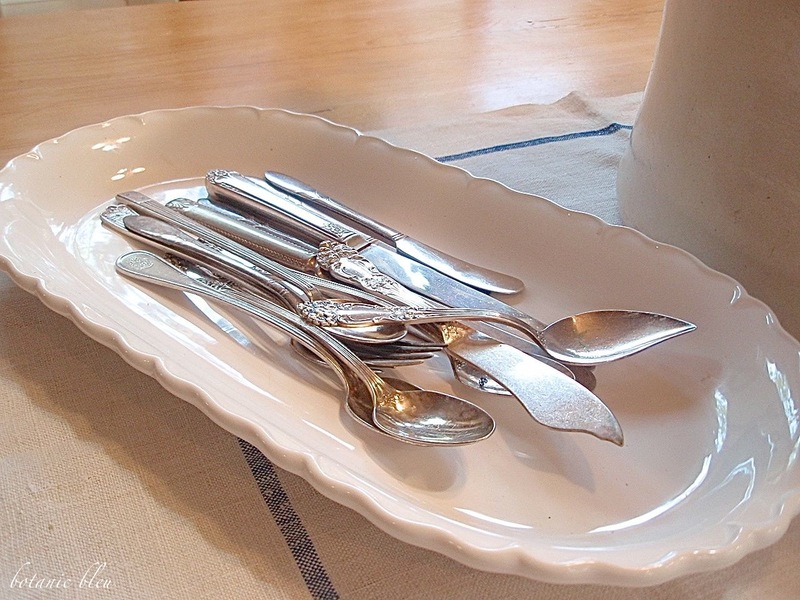 The tray full of silverplate came from a vendor at the Hico Antique Show. Special plans for most of the pieces are on my to-do list for this summer. The curved spoon and knife, however, will be used as they are. They are just too pretty to change. Also on my summer to-do list is to clean and to rearrange the china cabinet. I am swooning over the crock. Pinned every pic. Perfect for the Nordic / French thang ! Wishing you a wonderful Memorial Day weekend. Perhaps your 75 mile drive instead of the longer (snaky) drive was really what was meant to be. Serendipity and a gorgeous day rewarded you with real treasures along the way, wildflowers, fried catfish church lunch a day with friends... Loved this post amd again I learned from you today. I never knew the numbers on the crocks meant how many gallons it holds! Gorgeous silver, lovely finds and yes during the Holidays a tree will look amazing in the crock. Have an enjoyable Holiday weekend. 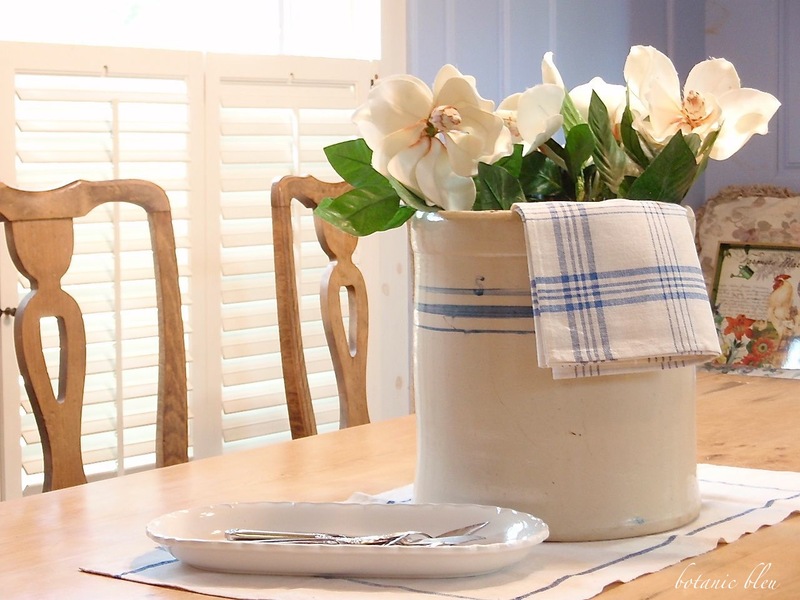 I absolutely love your home and your new finds fit in perfectly. Judith, I need to put this show on my own list. Sounds like a fun time. How often do they have it? Love the crock. It will be fun to use for so many different things. 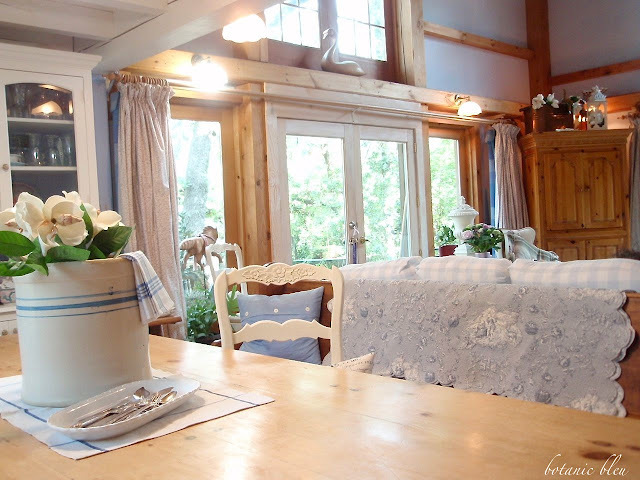 Your home is always so pretty and inviting. Love getting to see it! 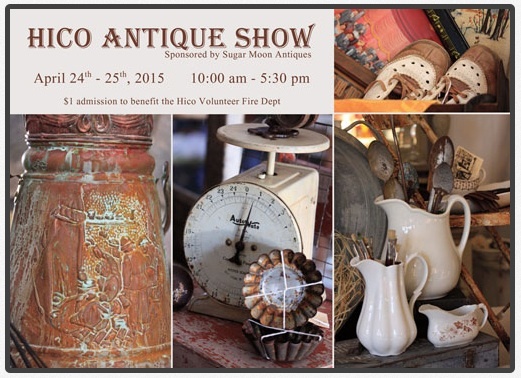 The Hico Antique Show is held twice a year: the last Friday/Saturday of April and the last Friday/Saturday of October. I haven't been to the show in October, but have been a couple of times in April. If you go, be sure to check out a nearby small town of Clifton that has a small antique mall. That's where I found the crock this year and have found things in past years. 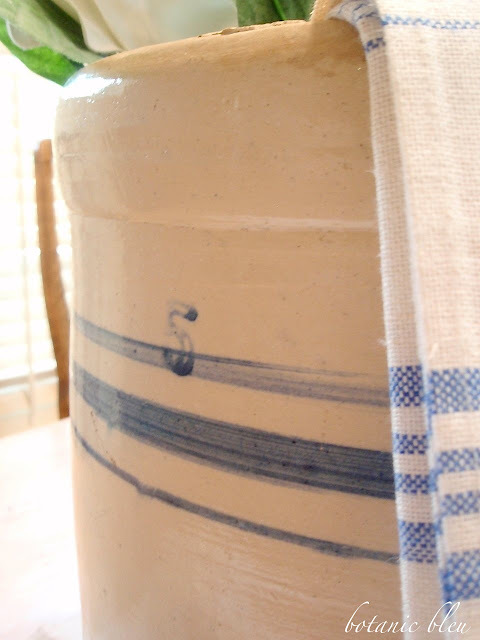 Judith, of course when a home has your connection to blue and whites it's almost impossible to not notice the next great find that will fit right in.... 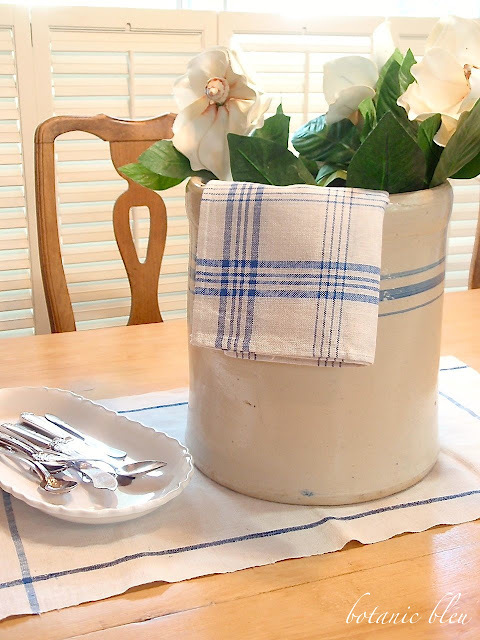 Your home amazes me, the new find ( crock ) looks great on the dinning table along with the linens, as for the tray of vintage flatware it's a favorite of mine, I have a thing for flatware and stoneware. Don't you find sometimes the smaller Fleas have better prices, less people for them to expect and they want to make the sells so their more willing to deal. I bet everytime you spot a bit of blue you have to give it some thought to should I, or shouldn't I take this piece home with me ? See you and your beautiful home soon. I am totally in love with the crock; and jealous I might add. What a perfect addition to the table~ which I am also coveting. I love antique shows, fairs, malls... but I need to scale back, not continue to collect. I think you have a real eye for accents; French or otherwise. Bonjour Judith! I am late; finals and end of the year duties are exhausting me! 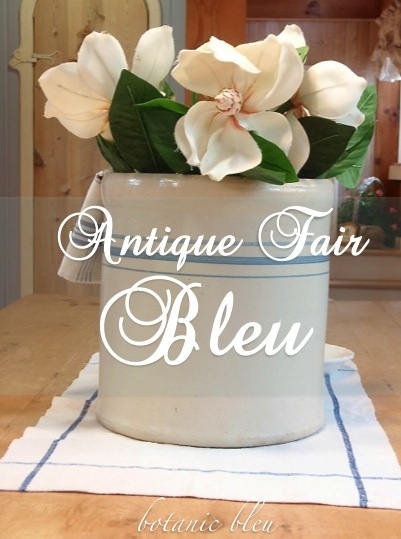 But it's great to come here to find your fair bleu beauty! 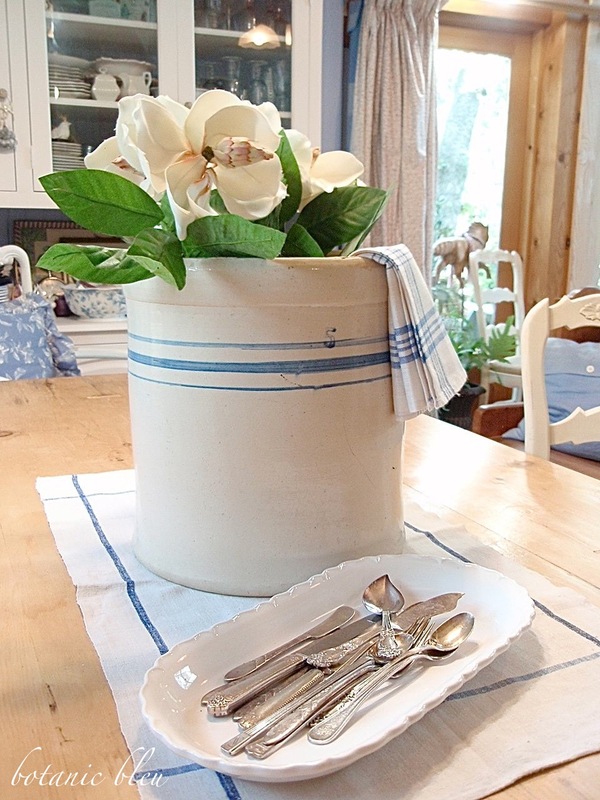 That crock is gorgeous and perfect on your table. I have a similar harvest table from England and it lends itself to so many French looks: farmhouse style, Provençal as well as a touch of elegance. Judith! Your new finds are wonderful! You styled them so beautifully in that MAGNIFICENT room that I a still drooling over. My goodness! Gorgeous! I wish you a blessed weekend. Beautiful! 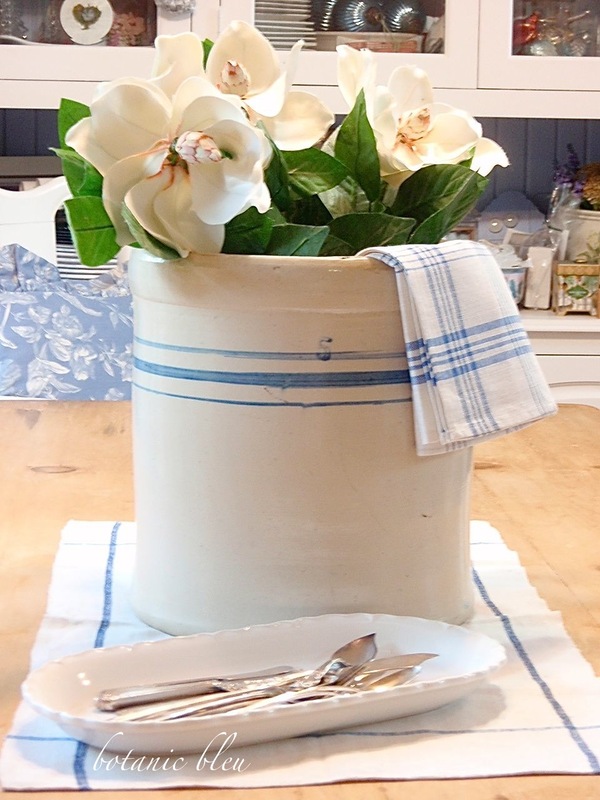 Blue and white is such a soothing combo. When I lived in TX, I found this large crock pitcher. The front was painted with blue bonnets. I love that thing so much because of the blue bonnets I miss now. Judith that is a wonderful crock! Thanks for joining Home Sweet Home! Appears along with an amazingly wonderful day, you have some great finds, as well!!! 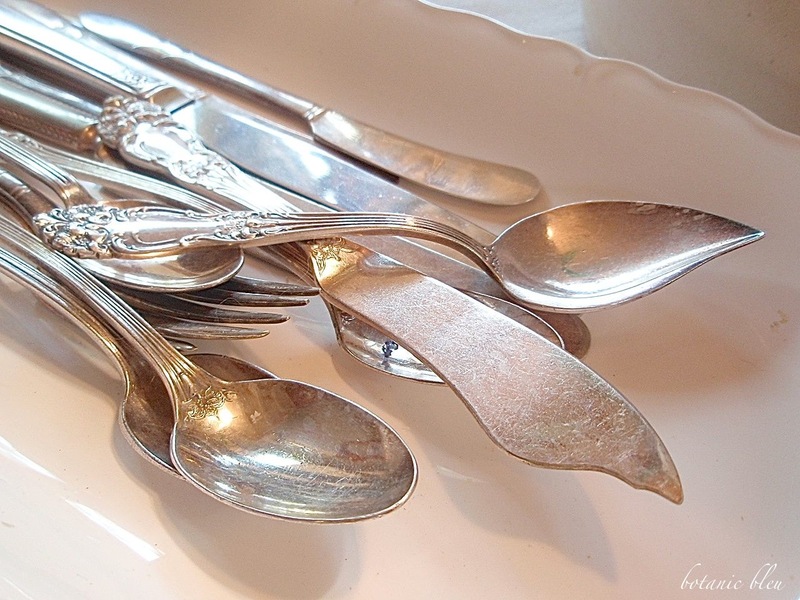 I'm l o v i n' all your silverplate, dear one!! !